John Wesley offers us a challenge: “Do all the good you can, by all the means you can, in all the ways you can, in all the places you can, at all the times you can, to all the people you can, as long as ever you can.” Wow! Now that’s a tall order for a missional agenda! Many years ago a young man from our congregation was looking for a service project he could do to fulfill the requirements for his Eagle Scout Rank. He decided to build a wheelchair ramp for a shut-in. He had to inspect the site, research building codes, recruit help, secure donations, do the building plan, and purchase materials, etc. before completing the project. This was the beginning of the FSUMC Wheel-chair Ramp Ministry. Today we have a dedicated core group of 10-15 volunteers who generously give up their ‘free’ time to help build these ramps for people who may otherwise be literally ‘trapped’ in their homes. As a result of this mission we have become a well-oiled machine of ramp-building comrades from backgrounds as diverse as doctors and textile executives, police officers and retirees, insurance executives and students! We have built so many ramps in so many places it is hard to remember them all! Over the last year, we’ve averaged about two ramps each month. Like any good project, we continue to ‘tweak’ the process to find the most efficacious methods of construction, materials, labor, and time. We have a very well-equipped Missions Trailer that has nearly all the tools we need (some more would be great!) so we can efficiently get to building when we get to the site. 1) Getting a 2500 or 3500 dual, 4 WD truck to pull our trailer. 2) Acquiring a place for storing extra supplies, truck and trailer. 3) Getting a larger dual-axel trailer with electric brakes. 4) Involving other churches so we can help ‘all the people we can’ and no one has to wait on a ramp. 5) Expanding our ‘range’ so we can reach out even further to ‘all the places’ that we can. If you would like to support the Wheelchair Ramp ministry, contact Tom Sineath. 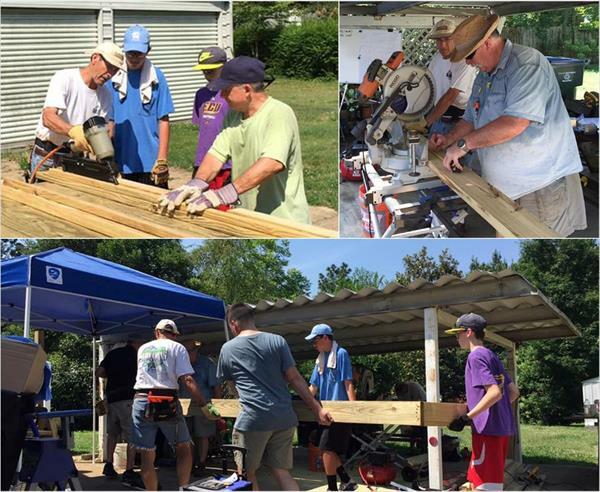 The FSUMC Wheelchair Ramp Ministry’s goal is to build 6-12 ramps per year. The need for ramps currently exceeds our ability to build them. The wait time can be long. If you are on Medicaid that agency should be your first resource. If you are turned down please attach a copy of their response when you apply. If you live outside of Alamance County, North Carolina. If you are a veteran the VA should be your first resource. If you are turned down please attach a copy of their response when you apply. If your need is beyond our capability or ability to do the work safely. If your need is short term (less than 1 year). Please note that peference will be given to applicants who own their own home or who are purchasing their home. 2) Click here to complete an online referral.